Jim was up at 6AM and I got up after 7:30. We watched some Today Show, had our coffee. Jim made himself bacon and eggs. I had a yogurt for breakfast. Today is the first day the Rally officially starts. We had to go up to the event room for registration between 8:30 to 11, we arrived up there right before 10:30. We always walked up but we had so much rain over night and all morning really, we had to drive up there. they had a lot of stuff we had to do, then they had a First Timers Meeting we had to go to. About 20 couples attended that. They had cookies and tea. Then when that meeting was over we went out and looked at the new FW that RV's for LESS brings for our group to look at. 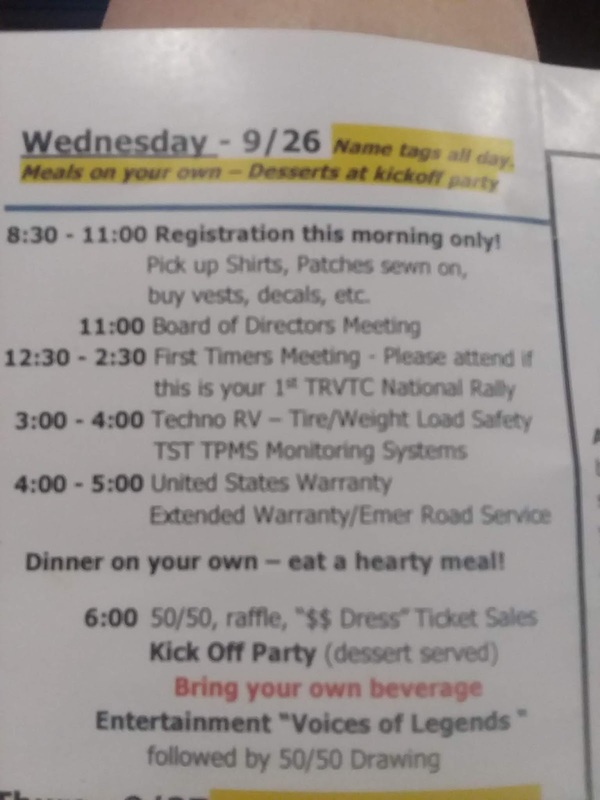 They are a local dealership that does a lot for rally's held here. They had Landmark's and DRV's, it was pouring then my feet were soaked. It stopped long enough for us to get back inside. 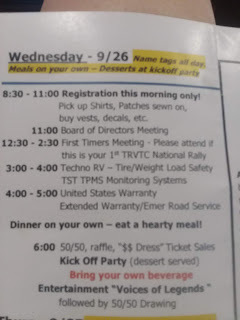 Then they had a class with Techno RV Tire/Weight load safety TST TPMS Monitoring Systems. One thing we still need to get is a Tire Presser MS.
After the class we drove back and had dinner, changed Jim showered and shaved. I called and left a message with Chris and Dave from TN we met them in Florida. She texted me later they are 120 miles away, they were going to come with there camper and see if they could get a site here. Hope we get to see them. 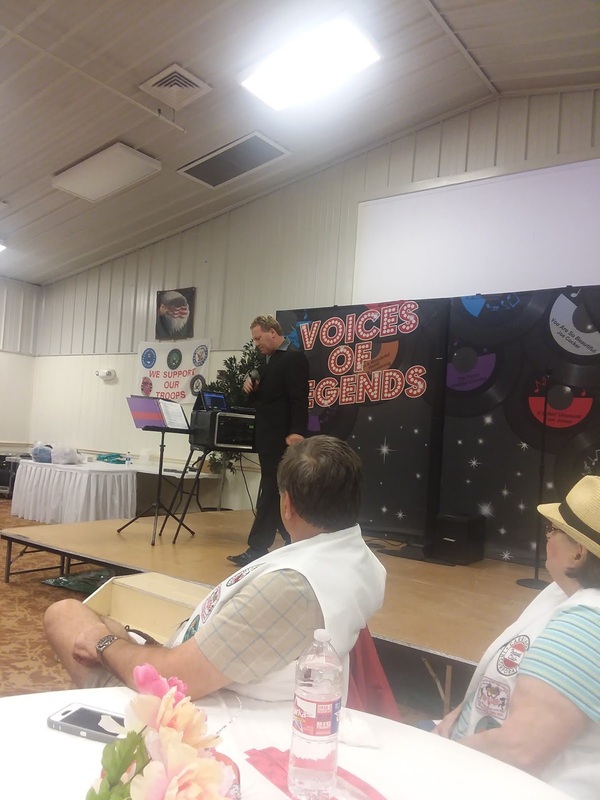 "Voices of Legends" a one man show did all kinds of different people singing. I kept track of all the singers. 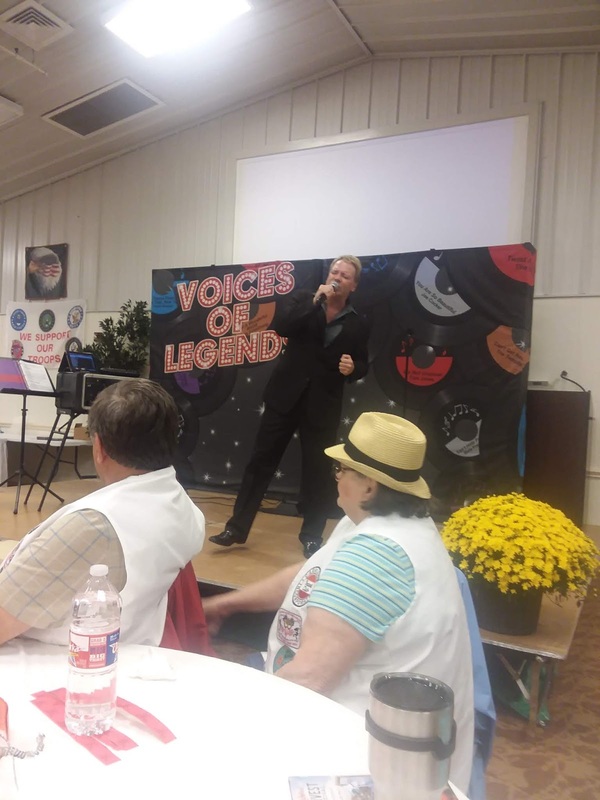 I counted 35 starting back in the 50"s like Paul Anka , Neil Diamond, Elvis, The Rat Pack, Tom Jones he was very good. Here are a few pictures. They still had left over cake so we had another. Then they did some drawing. We went back home. We were inside a few minutes and I heard the fridge beep. Here we had left the fridge open, it said it was 67 in there, lucky it is pretty empty. took a good half hour till it was back to 38. We watched some TV. I showered, and Jim went to bed first, I watched Jimmy Fallon first and blogged then bed.